ORTHODOX feminist Dina Brawer is certainly making waves both within and without the Jewish community. Dina, the wife of Rabbi Naftali Brawer, formerly of Northwood and Borehamwood and Elstree Synagogues, is studying to become an Orthodox rabbi herself through the New York Yeshivat Maharat, which grants semicha to women graduates. Jewish Progressive movements, such as the Reform, already have women rabbis, but the idea of the concept of Orthodox women rabbis is shocking to many. But Dina says she has met with "a lot of encouragement from many people", but admits: "Change is hard to manage. Some find it challenging." Her British launch in 2013 of the Jewish Orthodox Feminist Alliance caused controversy when it led to the formation of partnership minyanim in which women, as well as men, are called up to the Torah and help to lead the services. The minyanim have been banned from United Synagogue premises. Yet these minyanim, which are backed by only a minority of Torah scholars, and have separate seating for men and women, are claimed to be Orthodox. When nearly two years ago Dina was appointed scholar-in-residence at Hampstead Synagogue, Chief Rabbi Ephraim Mirvis warned rabbis against inviting "inappropriate speakers" to their synagogues. Now her fame has spread outside the Jewish community. Dina was chosen to be last week's woman of the week for Chocolate Films documentary series, 1,000 Londonders - Century 10 Women: 10 Decades. The documentary series features a woman for every decade of her life. At 46, Dina fits into the 40-50 slot. She was chosen for the documentary by Chocolate Films creative director Rachel Wang, the daughter of a Hungarian Jew. 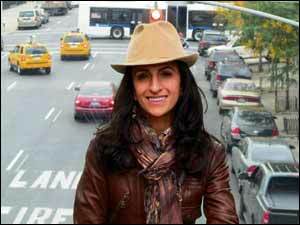 Rachel felt Dina was an "incredible role model for women's empowerment". The short film describes Dina's views on Jewish women and shows her teaching Torah at a London community centre. Dina was not always a feminist. She was born in Milan, the eldest child of a Lubavitch shaliach. She told me: "I don't think I ever felt disadvantaged as a girl growing up. I did not feel that I was second class. "As the eldest child, my father spent a lot of time with me, telling me chassidic stories, studying Torah and even teaching me to read Yiddish. "My Jewish school was led by an incredibly dynamic woman to whom everyone looked up. Most of my teachers were charismatic women." She added: "My childhood was in the early 1970s. Yet I never heard the term 'feminist'. I don't think my mother had even heard of Germaine Greer or Betty Freidan. "My parents were apolitical. The revolutionary spirit which coursed through the 1960s just passed over them. "I recall coming across the term 'feminist' as an explanation for why one particular teacher had retained her maiden name when she married. "As the history of feminism was never part of my formal education, I was about 19 when I first discovered that women did not always have the vote or equal rights." At the age of 16, Dina finished her high school education in Jerusalem and then studied in New York's Beth Rivkah Seminary, after which she taught in New York. She said: "As a Lubavitcher, my inspiration was to marry a soulmate with whom I could co-found and co-direct a Chabad House so as to teach and inspire other Jews." She found her soulmate, her husband, who became a United Synagogue minister. Dina said about her role of 'rebbetzen': "I was not a rebbetzen by virtue of being married to a rabbi, but rather a rebbetzen by choice. "I was fully active in the congregations we served and my husband always referred to our roles as 'our rabbinate'." Her first exposure to Orthodox Jewish feminism came in 2003 in Jerusalem where Dina was on a three-month sabbatical. She saw an advert for a Kolech Orthodox women's feminist conference. She said: "I went out of curiosity. I'm always interested in learning something new." It changed her life. She joined Kolech's American sister organisation, the Jewish Orthodox Feminist Alliance which she later launched in Britain. She then enrolled in New York's Yeshivat Maharat's four-year semicha course for women. Founded in 2009, Yeshivat Maharat's aim is to enable Orthodox Jewish women to achieve positions of leadership on a par with those of rabbis by granting them halachic semichot. Its four-year course includes a thorough knowledge of Jewish law, Talmud, Torah, Jewish thought, leadership training and pastoral counselling. Although giving its graduates semicha, Yeshivat Maharat leaves it to them and the organisations for which they work to decide upon their titles. Some are called Maharat, one Morateinu, others Rabba. One is actually called Rabbi. Some don't take a title at all. Dina, who hopes to qualify next year, has not decided on a title. Nor does she envisage any formal synagogal role for herself when she gains her new ground-breaking qualification. In fact, she and her husband Rabbi Naftali, who left the United Synagogue ministry to become chief executive of the Spiritual Capital Foundation, are leaving Anglo-Jewish formalities behind them and generating a more spontaneous form of spiritual and educational expression with their pop-up events and minyanim under the auspices of their movement, Our Mishkan. Named after the mobile sanctuary of the wilderness, Our Mishkan moves around from public places to private homes to bring Judaism to Jews who may not be particularly attracted to synagogue services and lectures. Our Mishkan pop-up events move from art galleries, where the couple talk on Judaism and art, to private homes in which they hold unique Shabbat and festival services. Dina says: "Our Rosh Hashana and Yom Kippur services are in a playlist format. Just like you don't have to buy an entire album any more, you can just choose a song you like; we imagine the shul service as an album. "We have designed the service into smaller units with a topic and a theme so people can come for an hour if they wish and not for the whole service." When I asked if these services were still Orthodox, she replied: "Why wouldn't they be? Men and women sit separately. We have a mechitsa." She claims a complete cross section of the community attend the events, from three-times-a-yearers to those who want a deeper meaning to the service and Judaism. "It is not for one particular type of person, but about the values we share," she says. The halachic problem of the controversial partnership minyanim is got around by not having anyone leading the service. She said: "It is not a regular, traditional service. Everyone davens together at the same time. "My husband and I lead it together. We set the pace and give explanations." So how will things change for Dina when she gains her rabbinical ordination? She replied: "I will continue doing what I am already doing, inspiring a younger generation of women to bring Torah into their everyday life. I hope more women will gain better Torah textual skills." Even before her ordination, Dina is already a formidable Jewish educator inspiring both men and women by her Jewish vision with its accent on ethical values.